There are a lot of jokes regarding the squishing and squashing process of a mammogram. And while the jokes may not stray too far from the truth for some, we often allow our imaginations to get the best of us. 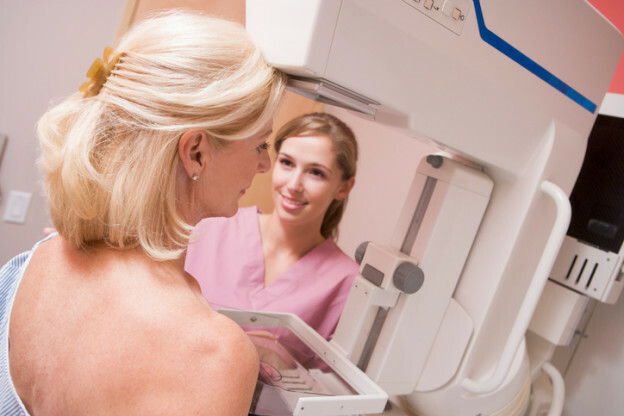 A mammogram is an x-ray of the breasts that is used to look for breast cancer in women. Mammograms can often find cancer that may be too small to be felt or seen. Finding cancers of this size and that haven’t spread provide patients with better chances for successful treatment. It is recommended that women over 40 have an annual, routine exam done. Plan ahead. Prior to your exam, there are a few things you can do to assist with the potential discomfort. Try reducing your salt and caffeine intake leading up to your mammogram, as these can cause bloating and tenderness, which can increase discomfort. Also, if you are premenopausal, try scheduling your mammogram one week before or after your monthly cycle when your breasts are typically less tender. Go au naturel. The day of your screening don’t use deodorants or antiperspirants. Also avoid powders, lotions or creams. These products can sometime show up on the films, preventing the radiologists from being able to read them accurately. This can often require a repeat exam, which can increase your discomfort level. Dress for success. It is suggested that you wear a two piece (pants or skirt with a top) outfit to your exam. A comfortable blouse which buttons in the front is optimal, allowing for the top to be easily removed for the exam. Wearing flats may also help when having to ‘get into position’ and remaining comfortable. Speak up. If you are nervous or have questions, talk to your doctor. During the exam, let the technologists know of your pain and discomfort, they may be able to adjust the machine and compression to relieve you of some distress. Relax. The exam is over quickly, roughly 20 minutes, so take deep breaths and try not to focus on any pain you may be experiencing. Also, results can take up to two weeks, so don’t allow worry to consume you if you don’t hear back from your doctor right away. For more information, please visit www.womans.org/cancercare.